"A Serial Novel Unstuck in Time"
A paperboy in 1977 is inspired to experiment with space/time when a mysterious apparition interrupts his morning route. Now he has a time portal. All he has to do is figure out what it's for. 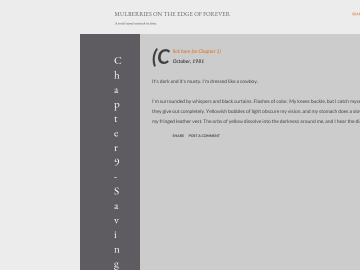 Mulberries on the Edge of Forever has not been reviewed yet. Mulberries on the Edge of Forever has not been recommended yet.